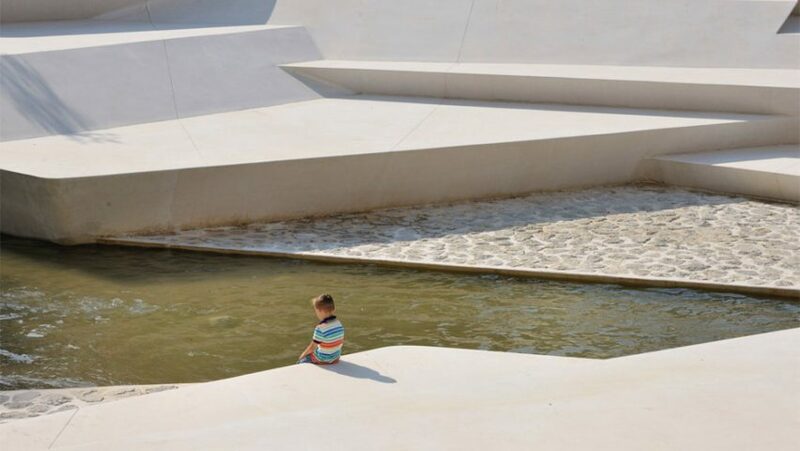 A+Awards: angular steps and terraces line the banks of a shallow waterway to form a promenade at the heart of Velenje, Slovenia – a project that earned Ljubljana firm ENOTA a 2016 Architizer A+Award. 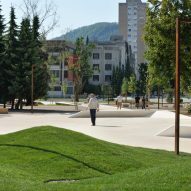 The Promenada in Velenje's centre forms a public space and thoroughfare for the young town, designed in the 1950s in the modernist tradition of the garden city. 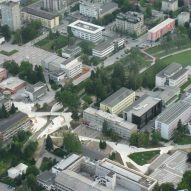 It is the only one of its kind in Slovenia, and has grown to become the country's fifth largest urban area. ENOTA renovated the civic space to kick off a wider revitalisation of the city centre. "Its tasks are to supply the city with the missing programmes and to help it reclaim its original character of a town-in-a-park," said the firm. 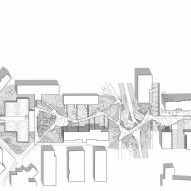 Aiming to add both greenery and events spaces to the area, either side of the River Paka. The landscaping was planned to open up its banks and draw more attention to the fast-flowing stream. "The River Paka is a torrential river, which means that its watercourse swells up significantly a few times a year, but remains relatively shallow at all other times," said ENOTA. 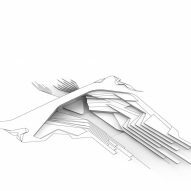 "As a consequence, the riverbed is very deep and until now, the river – which is an attractive element of any city – flowed out of sight somewhere down below." Angular stone terraces that vary in height and depth create pathways beside the water. Smaller steps form an amphitheatre for public performances, or relaxing in the sun. The existing bridge connecting the two river banks was replaced by a narrower structure that sits off-perpendicular to the waterway. Paths emanate from the centre to connect the surrounding buildings and streets. In between are grassy areas with exaggerated mounds, and plazas dotted with trees and sculptural benches. "The river may once again claim an important spot in the townspeople's consciousness," the architects said. 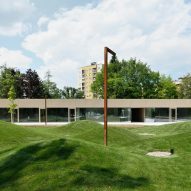 The Promenada Velenje completed in 2014 and won in the Public Park category at the 2016 A+Awards. Photography is by Miran Kambic.